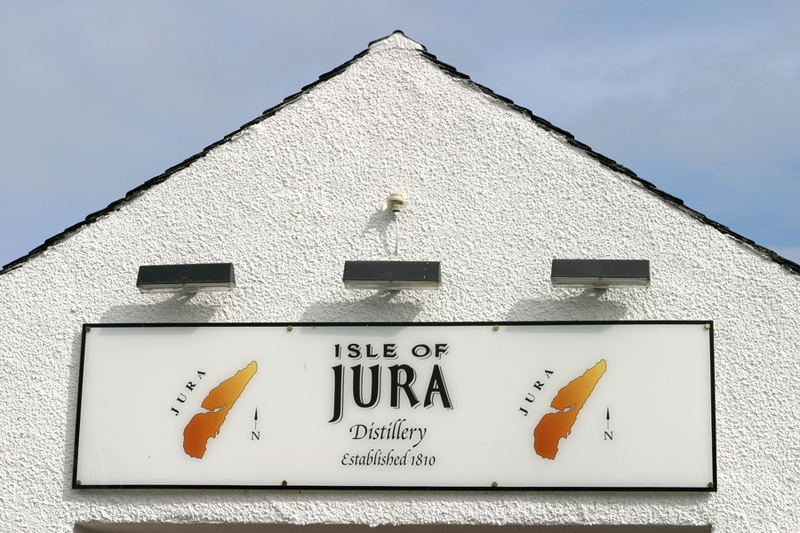 It’s a two-part process getting from Jura to our inn, the West Loch Hotel near Kennacraig. First, we must take the short ferry ride back to Port Ellen on Islay. I notice that as Charles drives off the boat, there is a single sign post with two words on it: ARDBEG, with an arrow pointing right, and BOWMORE, with an arrow pointing left. Islay, then, is a place where directions are defined by which whisky distillery you’re headed towards. 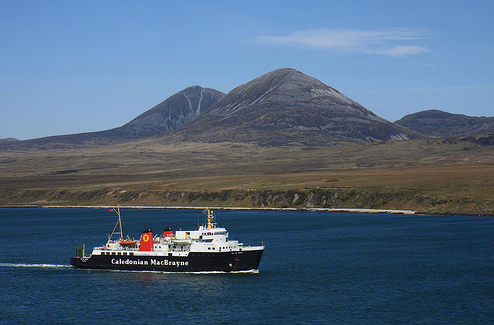 CalMac ferry to Islay with Paps of Jura in the background. Photo by David May. 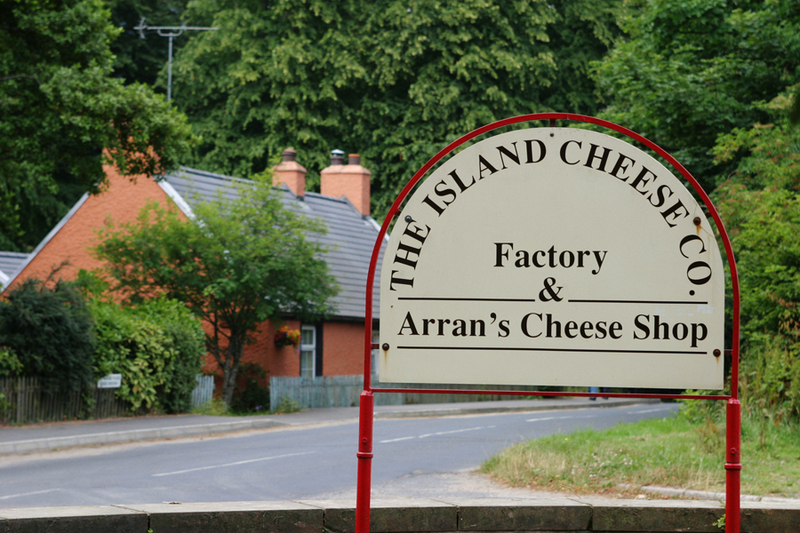 We then have to wait 30 or 40 minutes in Port Ellen for the Isle of Arran to take us to Kennacraig. I’m feeling a bit washed out for some reason when we arrive back in Port Ellen. Something about the solitude on Jura and my time sitting in a dark, dank farm house drinking tea and listening to the stories of Mike Richardson—thinking of Orwell and the Future Stone and the island faeries has left me feeling reflective. I’m thinking it might be nice to find a pub near the harbor and Charles tells me there’s one nearby that has several walls covered with excellent murals of island scenes depicting the local people. He says it was painted by an Irish artist, each character being placed in the composition in return for a dram—or two—of whisky. “They say the chap died of drink shortly after finishing the mural,” Charles says. Great. If that’s Charles way of suggesting we just sit in the car waiting for the ferry, he’s successful. The wind has come up and there’s an icy chill in the air as we lumber on to the Isle of Arran, part of the famed Caledonian MacBrayne ferry line—what everyone around here just calls “CalMac.” Without CalMac, it would be almost impossible to get around the west coast of Scotland. Just perfect with soggy chips and a bottle of Islay Ale. Afterwards, I do find a quiet corner on the boat where I quickly fall asleep. When I awake, an hour or so later, we are in Kennacraig. It’s a short drive to the West Loch Hotel, a sort of cozy farmhouse, where I find a most inviting fire crackling in the bar and men wearing fishing clothes sitting around quietly enjoying a whisky. I order a drink and stare at the fire. After awhile Charles comes downstairs and suggests we have dinner in the restaurant. I tell him I think I’ll pass. 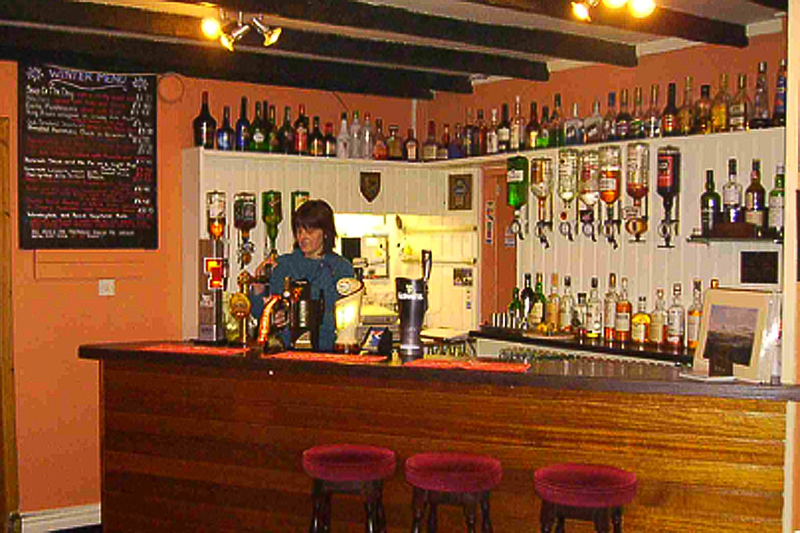 The bar at the West Loch Hotel near Kennacraig. “Are you feeling alright?” he asks. He heads off for the little restaurant overlooking the loch. I finish my whisky, order another one, and think about the Irish artist and his wall mural. I’m wishing now, for some reason, that we’d gone to see it. On an island where myths abound and the wee people are still thought to be responsible for life’s mishaps and mislaid possessions, I’m not too surprised when our Jura guide, Mike Richardson, a sprightly septuagenarian, tells me as we walk through thick green fields to his croft house about a mile north of Orwell’s Barnhill, that the island is full of fairies. “I’ve had plenty of dealings with them,” he tells me, and then recounts the time he lost a farm tool and found it, a year and a day later, lying on the very road we’re walking on, just as an islander had predicted. 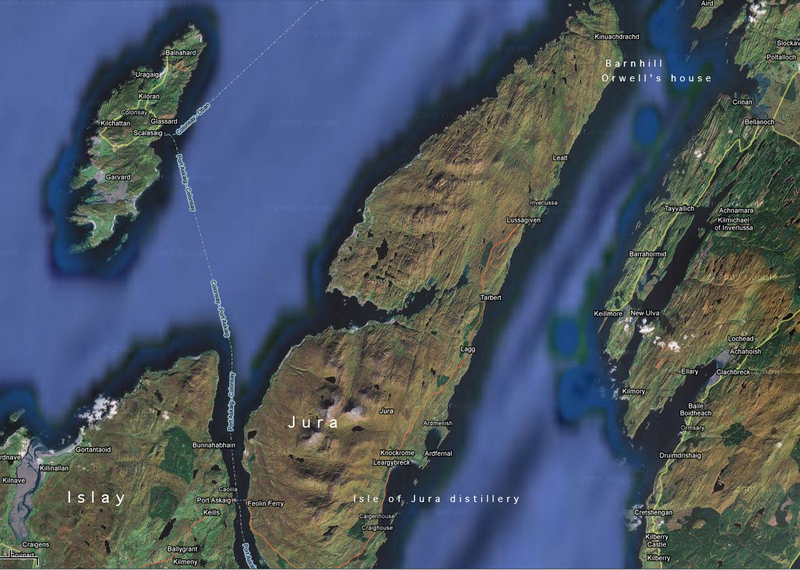 And then there’s the Future Stone, a huge piece of guartzite on the way to Corryvreckan, that was probably placed in the field we’re crossing some 5,000 years ago. Look at it from a low point towards a cleft in the western hills, Richardson tells me, and it marks the winter solstice. Over a cup of tea, Richardson points out features of the 250-year-old house, including it’s three-foot-thick stone walls, and the clever way he’s rigged water to flow to the kitchen from an outside well and electricity from a generator. While offering us another cup of tea, he tells us stories of the island: of being a stuntman in a BBC movie about Orwell, of his days as a fisherman on the island, and of the great difficulty in raising his three children here. It’s not until Charles clears his throat and purposefully looks at his watch that I realize several hours have gone by and if we don’t hurry, we’ll miss the last ferry off the island. Though Jura is only 30 miles long top to bottom, it will take us a good two hours to get back to Feolin to catch the ferry. As it turns out, there’s an afternoon wedding going on at the little stone church in Craighouse and we get stuck in the wedding traffic (at least four cars) on our way back. We’re the last ones on the boat. We drive for almost an hour along the perilous eastern coast of Jura along a gnarly track, known as “The Long Road,” that has even Charles holding his breath from time to time as the car dances on the edge of one precipice after another out over the sea. Finally we come to the end of the paved road and a gate with a sign forbidding vehicles to venture any farther. Waiting for us on the other side of the gate, leaning against a very beat-up and muddy Land Rover, is Mike Richardson. 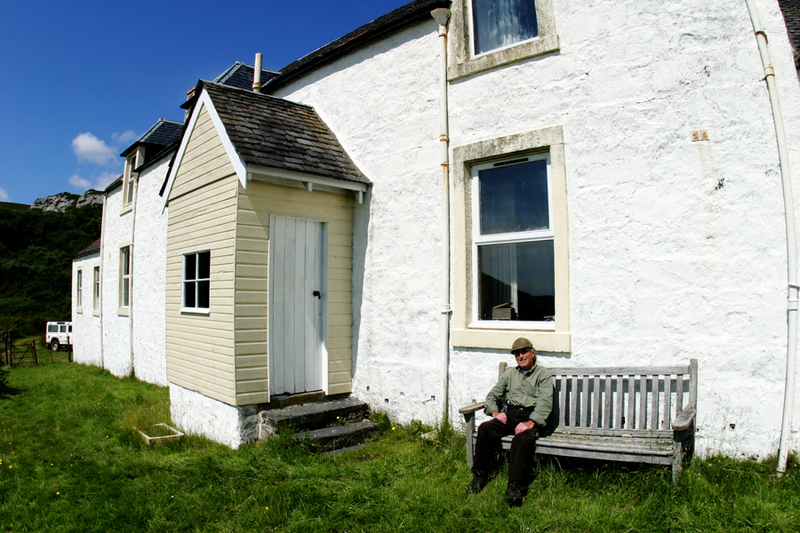 George Orwell's house, Barnhill, on the east coast of Jura. Photos by David Lansing. The George he is referring to is George Orwell, who came to Jura in 1946 to write his last novel, a book with the working title The Last Man in Europe (which ended up being published as 1984). 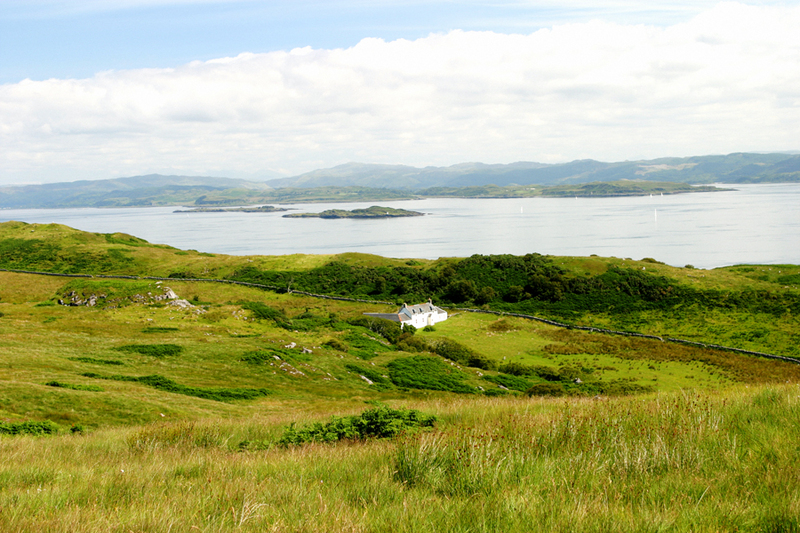 According to Richardson, Orwell was looking to get as far away from civilization as possible—which is why he picked the wild and unpopulated stretch along Jura’s eastern coast. After about 40 minutes or so we make it the five miles to Barnhill, the old white stone house built in the 1850s, where Orwell lived from May 1946 to January 1949. Richardson takes me upstairs to the bedroom just above the kitchen where Orwell spent most of his time at Barnhill hammering away on his typewriter. Mike Richardson in front of Barnhill where Orwell wrote "1984." Later we sit on an old wooden bench in front of Orwell’s house looking out at the stone field walls, probably erected during the Bronze Age some 3,000 years ago, and the cherry trees Orwell planted and the bay from which he launched a 14-foot dinghy and tried to circumnavigate the island only to capsize just up the coast at the treacherous Corryvreckan whirlpool where he almost drowned. Or at least that’s the conventional version of the story. Which Richardson says with a wave of his hand is nonsense. Then why, I ask him, do people always talk about Orwell almost drowning at the Corryvreckan whirpool? 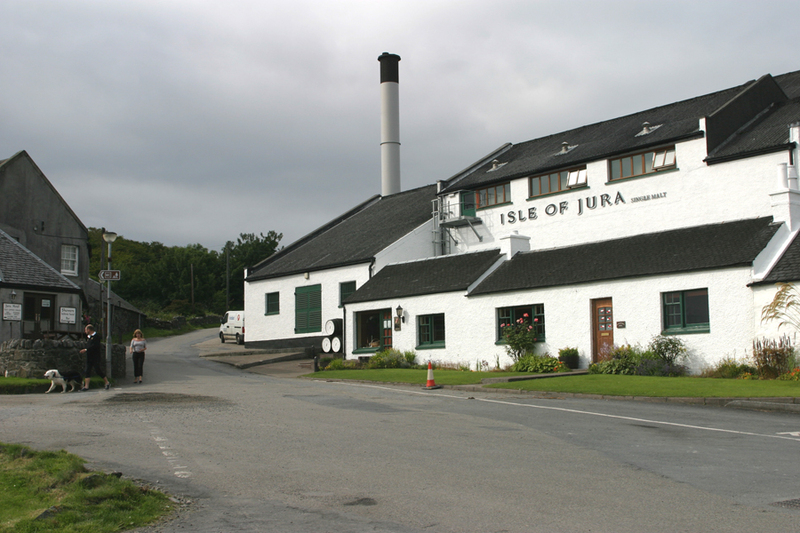 Jura has only one road, but it is the ultimate Great Wee Road. The narrow, twisty lane from the ferry landing to Craighouse, where the Isle of Jura distillery is located, seems absolutely indulgent once you see the road north of here. The busy main drag in Craighouse, Jura, a village with "one pub, one shop, and one wee hotel." Photos by David Lansing. But they haven’t given up on smoky, peaty whiskies completely. Charles and I sit in Michael’s office nosing a new expression called Superstition in which the island peat used to make the whisky has to be cut when it has a certain amount of moisture and oil in it. Usually the peat used is only perfect for a couple of weeks out of the year. If they miss the window, the whisky is off. Which is why it’s called Superstition. It’s a lovely dram. Maybe my favorite of the three dozen or so whiskies I’ve tasted so far on this trip. The smoke in the whisky is apparent, as is the brine. When I mention this to Michael, he’s pleased as could be. Before heading to the north end of the island, we stop at the Jura store to get a bit of dark chocolate to go with the bottle of Superstition I’ve bought. 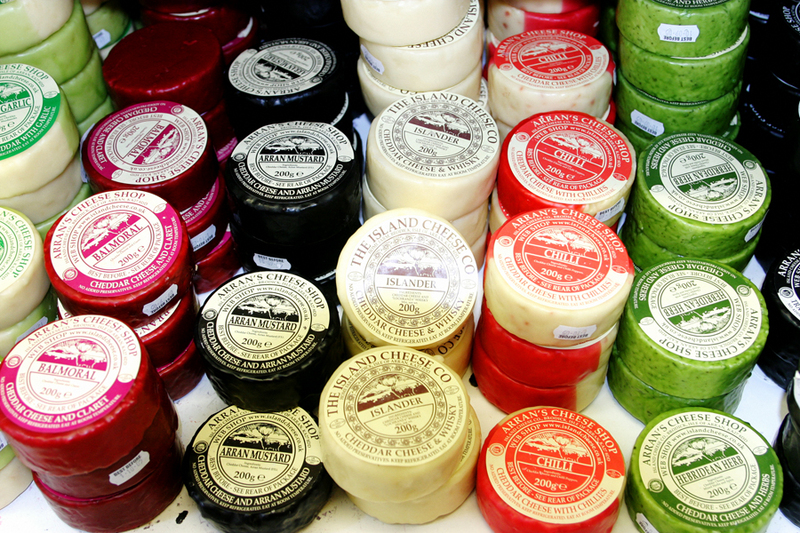 A red-faced man is leaning against the counter in the tiny shop complaining to the shopkeeper about being the only one at the dance at the community hall last Saturday to wear a kilt. “They’re fine lads,” says the shopkeeper.